When the Arizona Biltmore opened in 1929, it was immediately dubbed "the Jewel of the Desert" for its Frank Lloyd Wright-inspired architecture. Constructed of ornamental concrete blocks and capped by a copper roof, this landmark four-story hotel looks like no other on the planet. Inside, gold leaf covers the ceiling of a cool, cavernous lobby accented by stained glass murals, colorful tapestries, and distinctive furnishings. 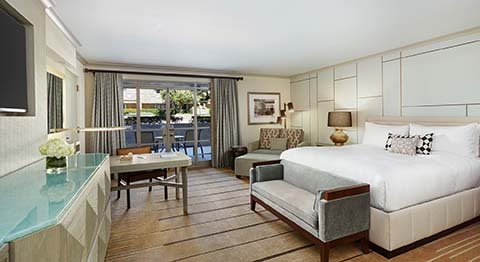 Great properties never rest on their laurels so it isn't surprising that the Biltmore would undertake a thorough refurbishment of its accommodations for the celebration of its 85th birthday last year. Still, as I checked into my room in a block called the Paradise Wing, I wasn't prepared for what I found. I expected the Mission-style furnishings I remember from my last visit; instead, I stepped into room with classic touches but an overall very contemporary, almost avant garde, style. It was light and cheerful, its color palette drawn from the desert. There are hotel rooms that are mostly places to sleep, and hotel rooms where you could happily spend the day, and this might have been one of the latter if the resort didn't have so many other diversions. One was right out my window: the Paradise Pool—three pool, actually—with its kid-friendly 82-foot waterslide. Behind the slide stands the 22,000-square-foot Spa, a fitness center, and half a dozen tennis courts. Add two 18-hole golf courses, another handful of pools, a putting course, three restaurants—plus High Tea in the hotel lobby—retail shops, and a speakeasy (password required), and you have no shortage of ways to spend your time. Head pro Lon Mlnarik grew up in Phoenix, trained with legendary coach Butch Waltz, and later played for Northern Arizona University in Flagstaff, acquiring a 138 mph serve along the way. He originally came to the Biltmore as a designated hitter when a guest needed strong competition, then later joined the staff. He runs a daily clinic, gives private lessons, and handles the tennis portion of a large multi-sport summer camp for kids. He credits Waltz for teaching him to teach. "He could just sit there and break down your strokes," he remembers. "He'd have me doing these snappy drills. I picked up my knickknacks (little tips) from him," an approach, he says, that makes him very technical. When guests need matches, he taps the local membership, some of whom he's know for a very long time since as a kid he lived nearby and often played on these courts. Courts & Fees. There are six cushioned hard courts, all with lights and arrayed side by side with fences between in a line extending out from the patio adjoining the fitness center. 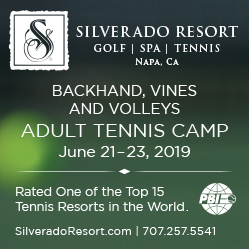 The facility lacks a pro shop, as such—tennis operates out of the tiny recreation office, which has tennis balls, while clothing can be purchased in the shop at the nearby spa. Mlnarik does take racquets for restringing. Spa and Fitness Center. A quiet oasis just off the Paradise pool, the spa has adopted a policy of using products that are pure, organic, and eco-friendly for treatments variously intended to revive, restore, and cleanse. Next door is fitness center and studio offering opportunities to workout along with classes in yoga, Pilates, body sculpting, and more. And ... Hiking trails take off into the adjacent Phoenix Mountain Preserve. Bikes are available for rent at the recreation desk. Or try your hand at lawn chess or croquet. The signature dining is Wright's At the Biltmore, an elegant space in a greenhouse-like enclosure, where the nightly cuisine focuses on local ingredients, including some from the Biltmore's own garden. For something more casual, there is Frank and Albert's for breakfast, lunch, and Sonoran influenced dinners complemented by craft beers. Finally, the poolside Cabana Club Restaurant offers sandwiches and salads. Travel Instructions. The nearest major gateway is Phoenix Sky Harbor International Airport (PHX), 11 miles to the south. Here's what others have had to say about Arizona Biltmore. "Resort itself is great, grounds are beautiful. Remember seeing 7 courts, all the same surface (that stuff they used to use at the Aussie open...felt good on the knees but really slowed the ball up). Took a lesson from Lon(the head pro), and in a little over an hour, he keyed in on two quirks, and gave me fixes. Excellent instruction.